Today is the midpoint of the celebration week - I am having so much fun filling the boxes and reading all of the comments and answers to the questions. At the top of my blog it says "do something creative every day." This represents the commitment I made January 1, 2009 to post daily to share my creative adventures and encourage others to join me. I haven't missed a day since 1-1-09 and I am motivated to continue when I read how many of you start your day reading my blog. It is amazing to know that people actually do read my ramblings and find inspiration from my work. Thank you all for joining me on my creative journey. I originally bought a Cricut in 2007 to help me with scrapbooking. We have thousands of photos from the years we spent living overseas and I wanted to get them into simple albums. I became a Creative Memories consultant a couple of years before I "caught the bug" and I really enjoyed helping people work out their layouts and preserve special memories. The Cricut diverted my attention from scrapbooking when I discovered all of the other types of projects I could create and when I started using Design Studio it more or less took over my creative life. 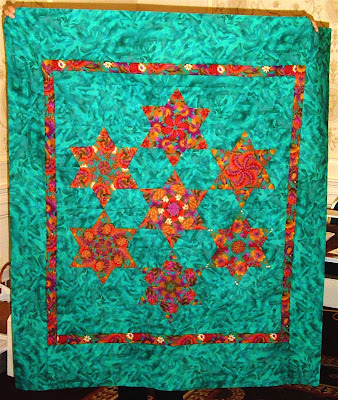 I have done all sorts of other crafts throughout my life and I also enjoy quilting - or at least making quilt tops! The two photos of quilt tops are both "stack and whack" style quilts and one of my early experiments with the Cricut was creating with a paper version of this technique. This was one of the cards I made - you can read more about this technique and see what I went through to try to get a properly sized diamond HERE. I am still a Creative Memories consultant and I do a lot of digital projects using the CM software. 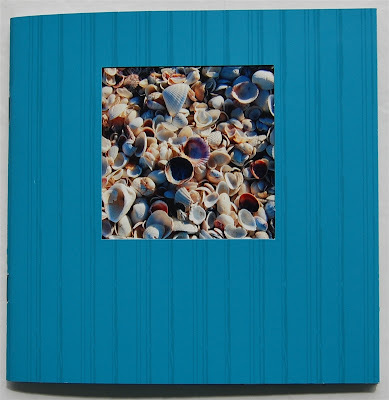 I was thrilled when Creative Memories started to offer Cricut cartridges and I thank everyone who has purchased Creative Memories items through my personal website (HERE). If you don't have a consultant and are interested in CM products, I would be happy to help you. The items I am adding to the boxes today are all Creative Memories products that were limited editions or are no longer available. If you are looking for something that was in the CM line a few years ago send me an email (capadiadesigns@gmail.com) - I just might have it on hand here. 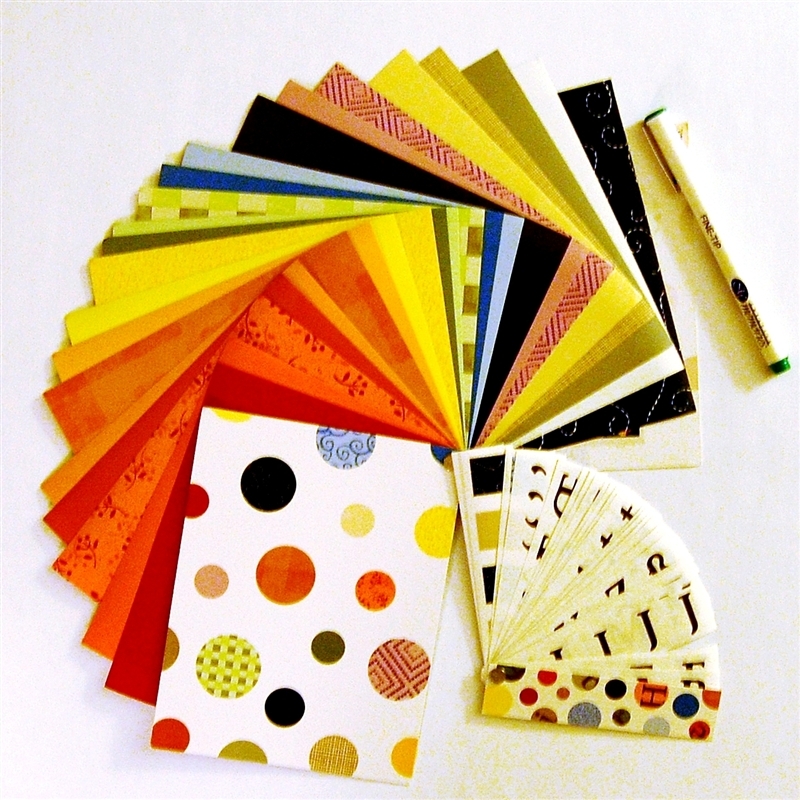 The first group of items is this collection of two paper albums and three packs of paper and stickers to complete them. They each have a large envelope you can use for mailing the completed albums. These are great to make for gifts for far away relatives. The theme is tropical. 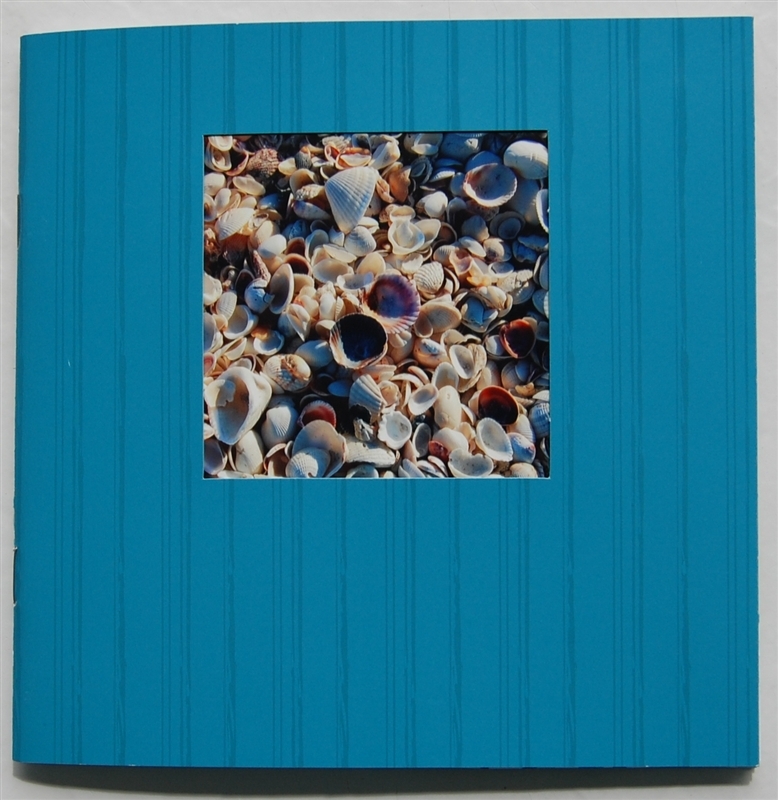 There is an opening for a photo in the front cover - these are a few sample pages from one of the paper albums I did for my husband's parents when we were on a family vacation in Florida in 2008. I brought along just this kit and a tape runner and had photos printed at the local CVS so I could assemble the mini album and give it to them while we were still on vacation! I think there is a tendency for our entire family to like blue! 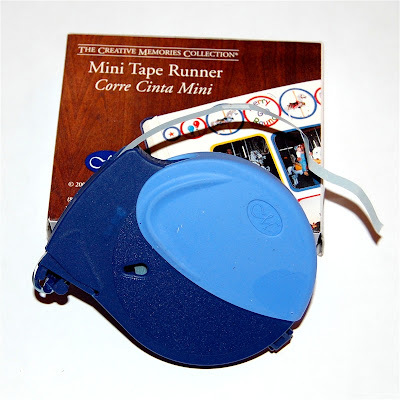 I am also adding to each box a mini tape runner - these are no longer made by Creative Memories but can be quite handy for tiny places. 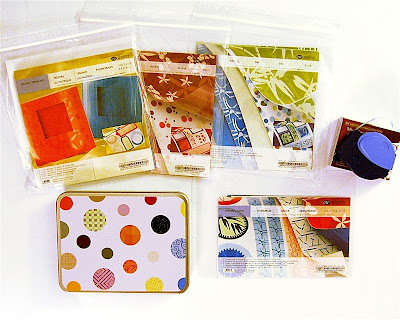 The third item is this little kit - a colorful tin filled with some adhesive shiny papers, a pen (random color) and some letter stickers (don't laugh - there are still ways to use these even if you do have a Cricut!). These boxes are starting to get rather full - and there are still three more days. It is a good thing that they will mail for a flat rate - I think they will end up being pretty heavy! Instead of reposting the directions, I would ask that if you have just come upon this celebration week and want to start at the beginning you go to Wednesday's post HERE and work your way forward. The rest of you already know how to play along! I used to crochet, but since my arthritis is getting bad it's hard on my hands. I started paper crafting to take the place of it. I love to use my cricut for new crafts now, like glass etching, vinyl and t-shirt design. Came here by the way of Facebook so, you know I follow you there! Just hopped over from Facebook today rather than linking directly from your blog as I usually do! 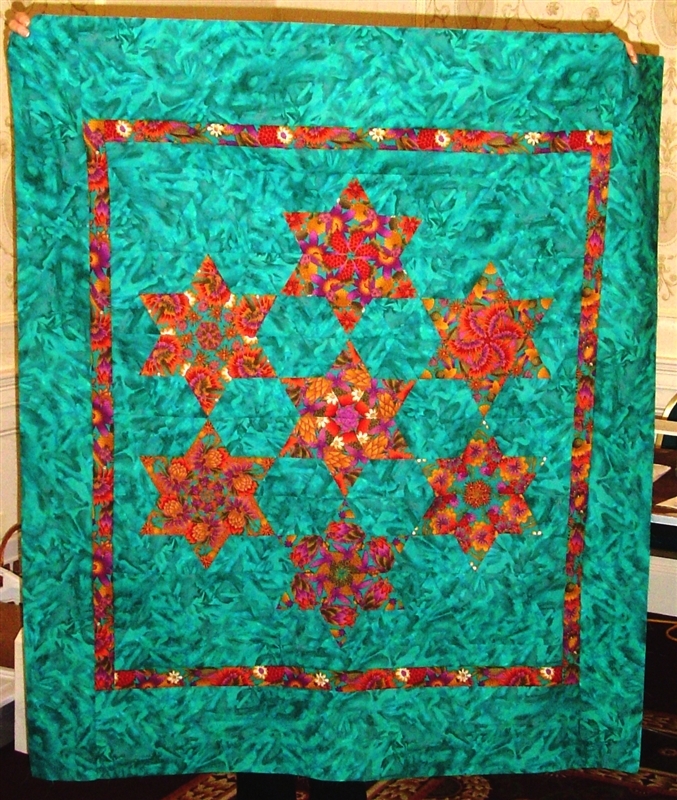 Hi Diane, I quilted extensively in the 80's, and still enjoy using quilt themes in other crafts. I also like mixed media crafting on canvas, love painting with acrylics, and you probably know my philosophy is no blank paper shall go undoodled! I enjoy hand sewing also, and even though there are not enough hours in the day, it is restful for me to just sit with a needle and thread and sew a garment; not embroidery or cross stitch, actually construct a garment. It still amazes me how you come up with so many ideas with the Cricut, and sharing on your blog makes you extra special! Martha-Kay Bolton. Moving back to Louisiana so gotta get that Southern double name thing going since that's what everyone will be calling me! One of my hobbies is sewing. This past week I've been making fabric flowers. It's great to combine my sewing and paper crafting. Thanks for your giveaway - it's awesome! I'm a follower of your blog and receive emails. Your emails start my day right! Thanks so much for them. My other hobby is genealogy. I just wish there was more time in the day to work on both hobbies! I am just beginning a heritage album using pictures from my grandmother, my family tree and my cricut. This is something I have wanted to do for a long time and my goal is to have it completed by summer. I have several albums to make for different branches of my tree! Thanks for keeping me inspired! second post - I am a follower of your blog! Look forward to it every day! 3 post - I am also a follower on facebook! Love your card - I'll have to try it as I used to make quilts back in the 80's! To answer your question well the obvious was scrapbooking which I got into in the mid 90's and now cardmaking but my new found love is book making and journal making! Mini Album - well years ago I made those frilly lace and fabric covered albums.. remember though - break out the glue gun! Not sure if I anwsered the question properly ... but back in high school I used to draw and paint - so I guess that would be a starting influence... whew! My other hobby is pyrography :) But i'm waiting summer to make this craft outside (it smells too strong to do it at home). Sometimes I use wooden details in by LO. Am a follower of your blog and enjoy it so much! I use to knit but don't as much, since, yes, the Cricut came into my life. It is now a passion! Again, great giveaway and thank you for this. I am a follower and email reader. I started out as a cross stitcher but I haven't taken a needle to cloth in quite some time. However, I still can and bake quite frequently. In fact, the growing seasons are a bit of a struggle because I'm pulled in two "creative" directions, that doesn't count how much I'm pulled in completely uncreative but incredible personal directions. Thank you for all of your blogging. I think I would have felt stunted by this craft without the assistance you give. Never enough hours in a day to do things we want! I pretty much stick to paper crafting.... more cards these days than scrapbooking. Most projects involve the Cricut in one way or another! Faithful follower! I love the quilts. 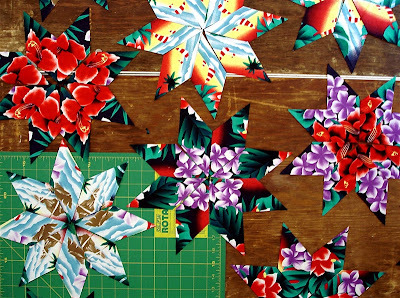 My mom used to quilt so seeing your beautiful paper quilts brings back great memories. Throughout my life I have enjoyed many hobbies including sewing (especially when my children were small), quilting, quilling, crocheting, knitting, playing with grandchildren, painting, scrapbooking, and card making. Card making and playing with grandchildren have sort of taken over what extra time I have since I am a full-time high school teacher. I have started a scrapbook/card making club at my school and it is beginning to gather steam. I just want to tell you that I am probably going to have to purchase a new laptop, though, because of you! The drooling over the boxes is making my keyboard sticky! JK. What a fantastic collection of products!!!!! Thanks. I love to cross stitch. As I get older my eyes do not permit me to cross stitch as much but that doesn't keep me from collecting patterns. Your quilts are beautiful and you have given me some news ideas for cards. Thank you so much for sharing your creativity. I x-stitch and crochet on occasion. I even learned to tat. But who has time for everything? I enjoyed quilting. nothing fancy but I enjoyed making them. 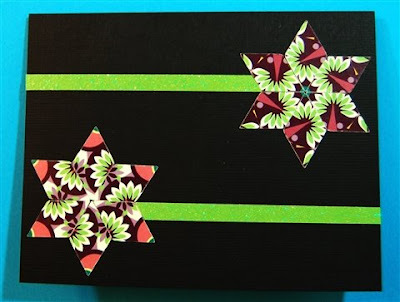 My Cricut came much later so it had no influence and by this time I was done with quilting as my kids took over my life.... :) I started scrapbooking 13yrs ago and the cricut just enhanced it when it first premiered! been hooked since! Scrapbooking, cardmaking, cricut is MY hobby today! I'm excited to see what is new each day! Thanks for your time. I also love photography and gardening. Now I can take photos of my gardens and scrapbook them or turn the photos into cards. I am also a follower on Facebook...Glad to see you have a page there! My other hobby is...of course...Photography! How els can you get those great photos to scrap??? HEE HEE. Would love to open one of those boxes! I enjoy reading your posts every day and appreciate them so much. In answer to your question, I really am not an artistic person, but have sewn all my life. I got into Cricut/scrapboooking when I was working on my youngest's senior scrapbook in 2009. I love cardmaking and have gotten to the point where I have set up my own craft/sewing room but with teaching fulltime during the day and parttime at a local college nights, my creative hours are limited. Would love to get one of these fabulous gift boxes. I admire your work and have "scraplifted" ideas! Diane - I first started in photography as a hobby. I would have a camera with me where ever i went. I was really good to put those photo's into a standard photo album. When I found the cricut i did slow down on printing out the photo's but definately not taking them - thank goodness for digital. If you figure out how to add more hours to the day - let me know!!!! I work as a full time nurse but honestly i would love to be able to craft more! I LIKE you on Facebook!!! Who wouldnt!!! The other hobby I enjoy other then taking tons of pictures is making jewelry. I had always wanted one with my children's names so I decided to make my own. Thanks for the chance to win one of the boxes. I consider myself a very crafty person; done a lot of things: sewing, crochet, cross stitch, jewelry making, quilling, smoking, wood carving, embroidery,and for a long time did metal embossing (which I thought was my thing). Now I only do paper crafting. Wish there were more hours in the day, but of course, I would still need more. Love coming to visit you everyday. I am a follower and love your ides. As you mentioned, I have enjoyed MANY other hobbies but scrapbooking has always been in the forefront. As a teenager, I was the unofficial scrapbook for our Job's Daughters Bethel and cheerleading squads. I've always LOVED paper and crocheting. Quilling and Macrame' came along in the early days while I was a Girl Scout leader. The Cricut has definitely taken center stage (I got my first baby bug on the day it was introduced in 2006). NEVER enough hours in the day!! P.S. Was I supposed to be making all of my comments here? I've been replying to the email I get with the subscription as one of my two methods. I don't have Facebook. 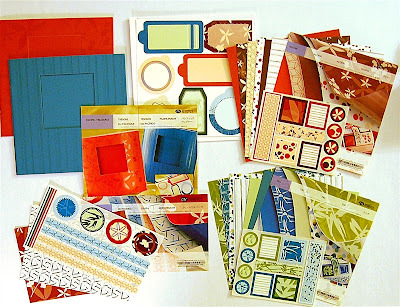 I have been a die hard scrapbooker for years & became a CM consultant 10 years ago. I, too, discovered the cricut & was instantly bitten by the bug. Having recently returned to work full time, my scrapping has diminished (which makes me sad)& I gave up being a CM consultant. I have a dedicated craft room, which is my safe haven & my "therapist." The cricut makes it easy to do a lot of projects in a short period of time, which is great because I don't have much spare time anymore. I love gardening, sewing, crocheting, and beading. Cardmaking is my current passion. It really keeps me interested in learning new things. Scrapbooking never caught my interest, but cards are just the right size canvas. I am a subscriber & also start my day by reading your blog. Thanks for your inspiration & dedication. I have tried a little of everything . I have tried rock painting, decorative wall painting, embroidery, but I like the Cricut the best because it does a perfect job the first time and my results look great right away. I am loving those boxes you are putting together. Thanks again for this chance to win! I am a garment sew-er and a quilter and still going strong with both of those in addition to my paper crafting. Although I do own a Cricut, I haven't mastered it yet -- every experience I have with the Cricut is frustrating. The instruction "manual" that came in the box is .... well, you can tell I am frustrated. Right now I am just leaving it plugged in in the hope that a lightning strike will fry it. My other hobby is reading, but I rarely do it now. Too busy using my Cricut, and making cards. I recently bought some knitting looms and have been playing with them. but I still leave time to scrapbook and card making which are my favorite. I start my morning out my reading all my blogs. I too was once a creative memories consultant, I miss seeing all the new items, I haven't been to a party for a long time. I love to organize, scrapbook, take pictures, read, put puzzles together, and sew. I would like to use the cricut to cut material. My mom just passed away and I want to make a quilt using some of her sweatshirts. I met you on the cricut cruise and just started reading your blog. My other hobbies are painting and crocheting. I have also done cake decorating, quilting, cross stitching, needlework and sewing. I tried knitting but just couldn't seem to get the hang of it. And, yes, paper crafts have definitely made me spend less time with these other crafts, and arthritis is making it more difficult to crochet. If I can just find the time, I want to start back into piecing quilt tops and perhaps spend more time with my painting. Is there ever enough time in a day - NO WAY!!! I am a follower and a subscriber of your blog and enjoy it so much! I have "liked" your blog on Facebook! 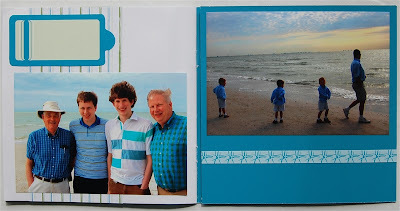 I have taken my love of family/genealogy and moved it to scrap booking. Putting the old photos and telling the stories in a scrapbook has given me HOURS of pleasure. I am making two minis right now and using Heritage Cricut cartridge to embellish. How good is that!! Not enough hours in the day, not enough days in the week, nor enough months in the year... will I every live long enough to get everything done that I want to?? I'm with you, girl! I follow you on Facebook and have you in my Google Reader. What more can I do to win contents of one of those boxes. ???!!!! I just can not get into digital scrapping until I use up my paper. I will never live that long. I used to do a lot of counted cross stitch. As I get older, tough, and my eyes are want they used to be, I find it harder to do -- even with bifocals! So, I guess I could say that scrapbooking took the place of counted cross stitch and that the Cricut has taken the place of a needle. Following you on Facebook, too. I every once in a while paint. It is just so much better when I use my Cricut as a template. I vary rarely do a freehand. I am a very daily faithful follower. My other hobby is trying out new receipes. I like to cook but don't like to clean up the mess. So, I do keep up with the cooking. lol Unfortunately, I don't get to craft as much as I would like. But, I do lurk around, follow, and subscribe to a number of blogs. Thanks for sharing your talents with us. NEVER enough time in the day!! I keep forgetting to mention that I have been a follower for a long time. I make jewelry, primarily for friends, family and charities. The Cricut and the Design Studio have taken over a lot of my crafting time but I have acquired so much stuff I had to move that to the basement.So, I do the jewelry making when I want to watch tv with my husband of 38 years. Quilting! Am working om my 5th grandchild high school graduation quilt. With pictures on it of them from kindergarten to senior year. I see paper I wish I had in fabric and fabric I wish was paper! First came sewing (I used to make many of my clothes), then came quilting, and a lot of other little crafts here and there. I started scrapbooking and cardmaking with ProvoCraft graphics and the progressed to the Cricut a year ago. I still make quilt tops and knit prayer shawls, but all the other crafts have gone by the wayside. I love your beautiful quilts. I started out learning to embroider when I was 5 yrs. old then moved on the cross stitching and needlepoint. I discovered scrapbooking when I was 8 but they didn't call it that back then nor did we have all the wonderful papers and stamps, dies and cricut etc. that we have today. I still manage to do all of the above but have added rubberstamnping, card and paper crafting to the gang. Oh how I wish there was more then 24 hrs. in a day! I use to paint. I hadn't had the time in while for one reason or another. My daughter had told me a few years ago. The thing she wanted most for Christmas was one of my paintings so this past Christmas I finally got around to painting her one, with her 2 kids at my side we all painted one for her..she was excited..
thanks for all your inspiration, and great ideas..
You were my first blog to follow and the one I look forward to most each day. I have researched my family tree for the past 12 years. When I got my first Cricut I did diverse a little by doing cards and other projects. I had reached a brick wall with my research anyway. I also enjoy making crafts for my church. You have given me a lot of ideas for that. The cupcake holder will be used at the Ladies Spring Luncheon next month. My other hobbies were and still are sewing and quilting. While I still don't make large projects like a full size quilt, I am sewing several times a week but mostly paper crafting has taken over my life. I have such a collection of buttons, ribbons, lace and other items that they go up to my paper crafting space. I stay up late for there is never enough time to do all the ideas that I want to make. So many carafts and so little time to do them in but I try! Love that you also quilt also. follower since I found your blog. Love your inspiration. thank You. Wow, so much in common. My other passion is also quilting. My mom taught me over 20 years ago and I just love it. I took the same class on Stack n Whack quilts. I will email you my quilt top. It's funny how you said "quilt tops" as we never get to finish them after that. 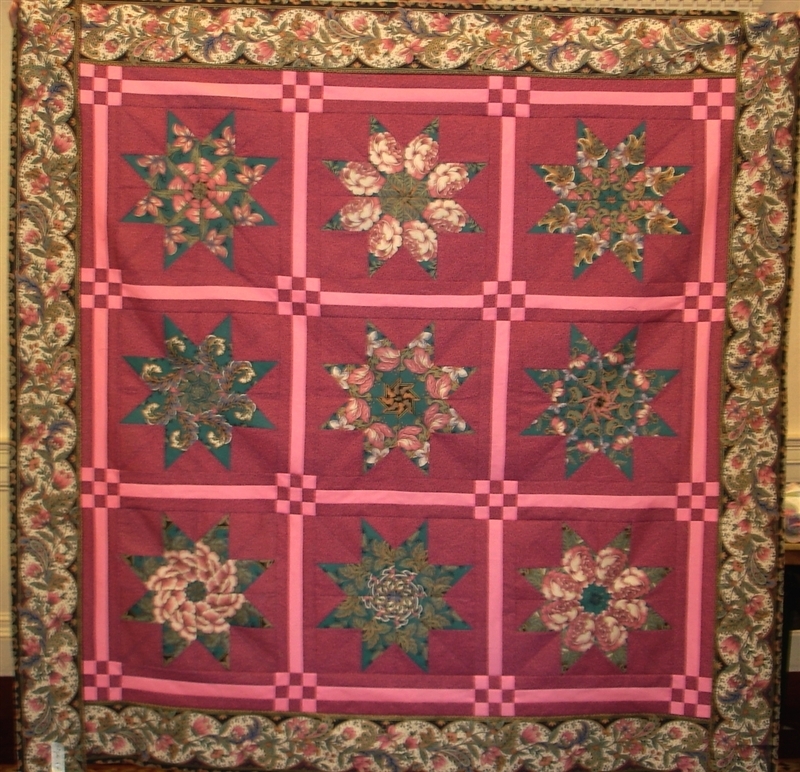 My mom quilts by hand. I send mine out to be quilted, except for the baby quilts. I used to cross stitch - no time now. I have three children - 3,6,9 and I try to read. Most spare time is used up in scrapbooking and journaling - I usually spend a fair amount of time writing. Great additions to the boxes. My other hobby is reading. I love a good novel, especially, a historical one. I love to imagine people falling in love within the constraints of social morals of the time when the book takes place. I dont know if it has affected my paper hobby other than I like vintage and shabby look. I love to stitch. I used to cross stitch, then added Hardanger and Canvaswork. These last 2 are the ones I still keep up with. I can't seem to get enough of them - only problem is it costs so much to frame the finishes pieces. I have also done some quilting. The love of stitching has fostered the fact that I like to do paper embroidery and ribbon flowers/roses etc. Thank you for all the wonderful goodies going into these boxes and the chance to win. I am a being facebook fan and I love to get your notices everyday. I am a follower of yours and I always look forward to seeing what brilliant things you come up with, keep up the wonderful work. I do needlepoint and crossstitch. I have worked a bit of embroidery into some special cards for others. Thanks for your blog! Would love to win! I think I've tried most crafts out there. I was a big cross-stitch fan and from there I went to tole-painting. Haven't painted much since I started paper-crafting but tole-painting taught me a lot about color and composition. I am a follower of your blog and love to see all your creative projects. My love is anything with paper. Keep the inspiration coming. I love anything that involves paper...decoupage, cardmaking, scrapbooking...its all good! I am a follower on facebook also. Good morning! I have to say I always look forward to reading your blog. You always have a positive, creative approach to everything. I have picked up many tips over the years, still haven't worked DSE like I should have, have printed many of your tips for DSE to refer to. You are truly amazing! Thank you for inspiring me daily. There is a bit of a downside to reading your updates first thing in the morning with my cup of coffee. I allow myself 1 cup of coffee after my shower and then it is time to get ready to go to work...problem is...I don't want to go to work, I want to stay home...LOL! Honestly I truly appreciate all you do for us. Thank you! Other hobbies...photography! Thank you also for offering this give-a-way! I follow your blog everyday and am always inspired to try something outside my comfort level. Never enough hours in the day! I also knit. Of course, I do much less knitting now and more paper crafting, but I manage to make baby sweaters every now and then. I really only do paper crafts but a few years ago I started doing diaper cakes and I love them. I have already done 3 cakes this year! I used to crochet and knit. I also used to decorative paint. I loved painting. It was my passion. 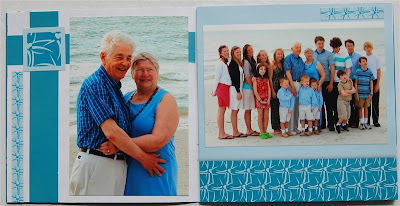 As I started having grandkids and keeping them on a daily basis I had to forgo the painting. I can't do it with little ones around. I always hoped to get back to painting but that hasn't worked out. I needed something I could do with little ones. Enter Cricut, and my new creative outlet. I think my expression has saved my sanity. lol I wish for more crafting hours too. I collect Fenton art glassware and Roseville pottery. I have soooo many hobbies, knitting, crocheting, painting, scrapbooking, card making, etc.... Yes, I merge them all together, I have painted on cards, and made crochet flowers for some....its a wonderful world to live in...CRAFTING!!!!! I am a follower. Your blog always contains beautiful colors and shapes to brighten my day. Enjoying following on Facebook so I don't miss anything. My other passion is gardening & I have a lot less scrappin' time during gardening season. My mb name combines my love of papercrafting & scrap quilts & my avatar includes flowers; so all my obsessions are equally represented! I love to go to flea markets and antique fairs and to Brimfields. I love scrounging for a bargain and seeing different and older things. That has influenced my scrapbooking/cardmaking in that I like the antique look and it's given me a lot of ideas for recycling and reusing old things. BTW...that mini tape runner is THE BEST for little bits and pieces. I was so disappointed when CM quit making it. I have crafted all of my life, I don't think there is a craft I haven't tried. These days I mostly do paper crafts, a lot of scrapbooking and card making, I do a lot of invitations for people, right now I am working on my daughter's wedding invites. The cricut comes in very handy. I also sew and do machine embroidery mostly for my 2 granddaughters. I knit, crochet, quilt cross stitch and have built 3 dollhouses. I cross stitched rugs and Christmas skirts for the dollhouses. Those stitches were VERY small and my eyesight does not allow me the luxury any longer. 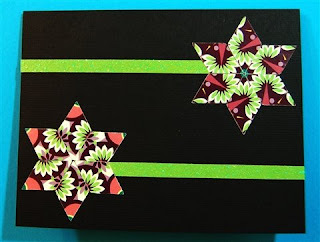 I have used some quilting techniques for cards that I make. I am fascinated by flowers in our yard and have a great many such photos stored. I have used some in my card making also. I used to primarily make jewelry... occasionally, I would make a flower arrangement or paint those little wooden birdhouses that you can find at Hobby Lobby, but I never did anything like what I've done lately. Cricut has recently eclipsed my beading habit, but I tend to go through creative spurts, so I'm sure I'll get back to it eventually. My Cricut certainly helped me prepare for a craft fair... I made the cutest little earring and necklace tags on which to display my pieces!! I enjoy receiving your email every morning via my subscription. I also am a fan on facebook!!! I like photography and still do that. I also like beading but I don't do as much of that as I used to. Before the scrap'in bug got a hold of me. I use to make all of my clothes and then when I started scrap'in that was the end of all other crafts. My DH still laughs about how it all started, he built me a cabinet for all for my great scrap stuff, the cabinet is 18 inches x 4 foot and I said, this is all I will need, now he has turned our 2 car garage into MY CRAFT SHOP.Oh my gosh, you sure put some great stuff in those boxes for this day, woo hoo!! !Have a great day. My hobby years ago was oil paintings. I really was good. Then my parents came to live here and being a care-giver 24/7 brought my painting to a stop. After my wonderful precious parents passed, I found that my hand had become to shaky to paint fine details. Comment 2 I am a follower. Now that I have the Cricut, I have found that my years as an artist has really helped in composing and colors of my cards and layouts. The Cricut, scrapbooking, and my other hobby...taking photos of everything all fit well together. I can't imagine photos without the Cricut or Cricut without photos. I am a subscriber to your daily newsletter and love it. I have way too many hobbies!! I love to research genealogy, I do may layouts digital and use the Cricut for cards, mini albums, etc. We tried out geocaching last summer and my 5 year old son loves it. As I look back over MANY years of crafting I realize all the different areas I have enjoyed and still occasionally go back to - sewing, cross-stitch, crocheting, tole painting, decoupage, etc. But now, scrappin' is my life. Eough time - NOT!!!! It seems like the older you get, the shorter your time - or maybe it just takes longer to accomplish things (like cleaning house, lawn work, and laundry!). My story is the same as some of the other "posters." My hands won't let me crochet much anymore. I got into s-booking, then cardmaking. My space only allows one project at a time. I love sending cards, so usually my scrapbooking stays packed up! Thanks for sharing your ideas and projects. I've dabbled with sewing and woodworking but I've always loved scrapbooking and rubberstamping, I try to use both together as often as possible. And of course the cricut changed the world of crafting! I love scrapbooking, sewing, knitting, and so many other hands on projects! There is always some kind of a mess/project around here! I love to sew (especially bags and purses) but find papercrafting to be in the forefront of my hobby time lately!! I don't think there is ever enough time in the day for everthing I can think of to do! I am a facebook fan and enjoy your posts!! I think that I answered the other question in comment 1 but here goes again. I have not been oil painting now since 1989 (that is a long time) because my right hand sometimes becomes shaky. The Cricut did NOT take that away but it did FILL a creative void that I had. Thank you for helping me understand the Cricut and DS. Guess that you have to read all 3 of my comments to get this story. Oh yes, I have NOT found a way to stretch time. I'll keep working on that. I use to cross stitch but really haven't done any projects in quite a while. The Cricut world has taken over my life. I simply love working with Design Studio and creating cards and layouts. Will always be a blog follower. Who has time for other hobbies?? Not me! Although in the summers, I guess you could say being by water...the pool or the lake...would be my other hobby. following you daily. this is getting creepy in a fun way. I have always enjoyed sewing and have recently tried using my cricut to cut fabric for an applique project. I love all the additions in the boxes and I love Creative Memories products. I also like you on facebook! Thanks for the chances to win! Some of my hobbies have spilled over into my card making. Quilting, knitting, cross stitch, embroidering, and occasionally I still do some of these except the quilting and that is now only on my cards. Love your blog and am a follower. This is all too exciting!! Look at those boxes!! My other hobbies include knitting and crocheting. I try to include a little something of this in my card/scrapbookking. The Gypsy and Cricut have pretty much taken over my crafting time. Some other hobbies I enjoy but do not do as much are: floral design, cross stitching, sewing, making fabric covered photo albums, and some decorative painting, etc. Thank you for this generous and incredible give away! It is exciting to look every day to see what you have added. I have always crafted - I have probably tried almost everything at one point or another. My current crafting includes knitting,crocheting,beading and of course rubber stamping and making cards. I do like to incorporate beads in my cards where I can and have on occasion made little crocheted motifs to put on my cards. I think the fiber arts influence the colors and textures I use in my paper crafting. There certainly are not enough hours in the day to do all that I would like to - especially when there is this little thing called work. Oh well it supports my hobbies! I look forward to visiting you everyday! I look for you on facebook too! I also like to craft making anything from fabric, and I also bead. I used to cross-stitch but that's gone by the wayside. ...and Of course, you have a Monkey following you! And I also follow you on Facebook. All Capadia, all the time! YAY!! I am a subcriber and a follower of your Blog. I look forward to opening your email daily to see what creative gem is there! I have learned so much from you. Thank you! The stack and whack was a fun quilt to make. I also do needlework when I'm watching TV. I tend to rotate from one craft to another. Remember those mop head dolls? I still have mine sitting on the shelf. T see you have the Bamboo, What is it and what can you do with it? I love to sew and I do computer embroidery. I must admit that I don't do as much of that as I did because I'm always playing with paper. I also knit and I am a gourmet cook. Love my Cricut and Gypsy, though!! I'm a follower and I try to read your blog every day - so much inspiration.!! FB follower and thanks again for sharing! I like to crochet, although I am not the good yet and don't do it often enough! Thanks Diane! 2nd chance - subscriber! Thanks for all you do Diane to keep us all creatively motivated!!! That quilt at the top is GORGEOUS! I so wish I had this talent. 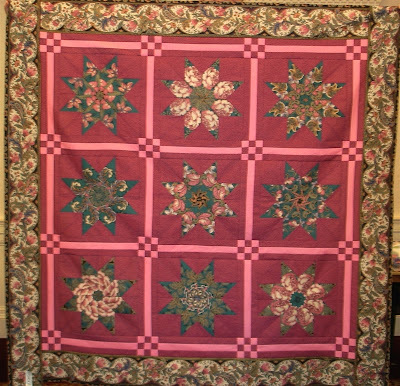 My great grandmother used to make the most beautiful quilts. I am a fan of yours on FB! Thanks for the extra chances! What a lovely idea! 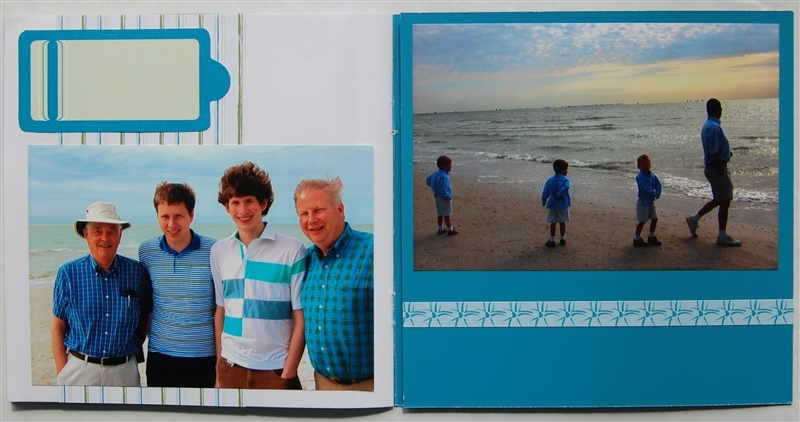 Your idea of bringing a mini album and tape to create an album while still on a family vacation is a wonderful idea. I love scrapbooking but I really enjoy gardening too. We live on 5 acres that used to take most of my time. I now have a more difficult dividing my "leisure" time between scrapbooking and gardening. Thank you for all you do! The only other hobby I am attempting to return to is reading. Using my Cricut has overshadowed everything (and that's okay). Before my Cricut came along (and also before my eyes got too old to see fine detail close-up without having to wear magnifying glasses! ), I used to do a lot of cross stitch and needlepoint. Over the years, I've tried - but not kept up with - a lot of crafts, but now I'm just trying to get my overwhelmingly large number of photographs scrapbooked. The Cricut comes in handy there! I used to do counted cross stitch. I really loved the way it looked when you were done. But when children came it was hard to sit down & do this because they always wanted to help. It was hard for me to pick it up & down. I started with cricut in Dec 2007. I mostly do that now. I love Martha Stewart punches also. I use to sew alot, so everynow and then I try to add some sewing to pages and cards when I feel it needs more texture. I have entirely too many hobbies! I like to sew (clothing, bags, well, anything really!) cross stitch, crochet, quilt, scrapbook, make cards, alter items, the list could go on and on. The cricut hasn't taken everything over, but I go in spurts of what I do each month. I love your blog and all your neat ideas!! Other hobbies (which I seem to have too many) are hardanger, sewing, playing bridge and playing piano. I love my Cricut tho and have promised all my grandchildren when they graduate I will have their scrapbook ready for them.